The Nili Fossae are a series of kilometer-wide fractures concentric to Isidis Planitia, an ancient impact basin. Nili Fossae is geologically interesting due to the stratigraphy (layering) of altered and non-altered rocks. 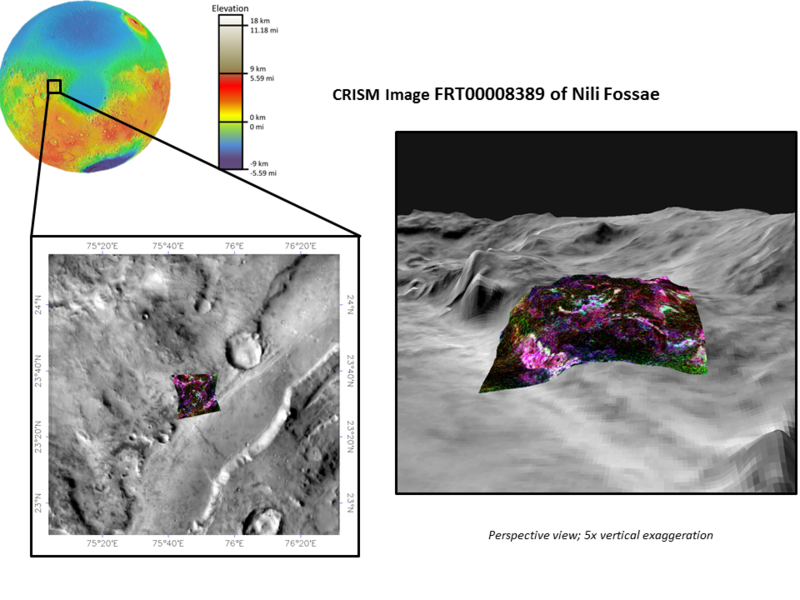 This CRISM image enables us to look at the rich and diverse mineralogy associated with one of the larger of Nili Fossae troughs. Inside the trough itself a layer of Mg/Fe phyllosilicates (red-pink) is overlain by a layer of carbonate (white). The surface outside the trough also hosts deposits of carbonates and Mg/Fe phyllosilicates, as well as hydrated silica (mint green). Phyllosilicates are clay and clay-like minerals formed by chemical reactions of rocks with liquid water. Carbonates form where carbon dioxide combines with the rocks. Minerals that formed by the chemical interaction of water or carbon dioxide with igneous rocks record information about the past environment in which the reactions occurred, and therefore are high science priority targets for future exploration of Mars.